Nothing says traditional and classic in your house more than the installation or restoration of metal ceiling tiles. The tiles, usually tin, came in vogue around the turn of the 20th century. They fell out of vogue because they provided little insulation and sound absorption. But tastes change, and now metal ceiling tiles have become popular again. Above, you're looking at the Real McCoy—an antique pressed-tin ceiling tile from the National Park Service's restoration of structures at Ft. Baker, near San Francisco. 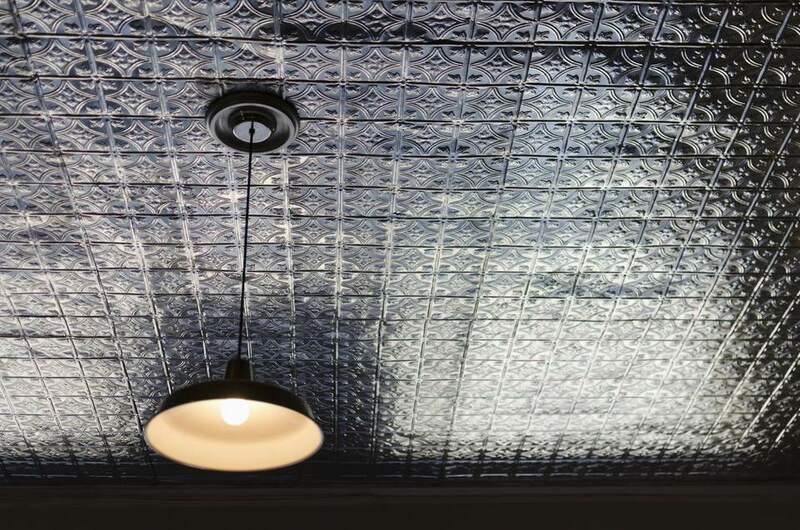 It's ironic that this style element signifies fancy or showy today, yet in years past tin ceiling tiles were essentially the equivalent of today's acoustic ceiling tiles: cheap, mass-produced, and applied to quite ordinary buildings such as hardware stores, general stores, and the Army barracks shown here. Now, prepare yourself to leave the world of ​reality and enter the world of plastic metal-look ceiling tiles. Why take a century "aging" your metal ceiling tiles when you can buy them already rusty and distressed? Unlike many ceiling tiles, these are made of real metal and have an embossed stars and stripes design. These are .3" thick vinyl plastic metal-look tiles with a fleur-de-lis pattern. How Can You Tell Metal and Faux-Metal Apart? But how can you tell when you're looking at them online? We've found that online retailers are sneaky—sometimes downright deceptive—when it comes to revealing the composition of their tiles. They'll go on and on about "antique tin" and "embossed metal" and "coppery luster," while holding back the fact that the product is actually plastic. Judge by price. Real metal panels will run in the $40 to $50 range for a 2" x 2" square. Faux metal will run $15 to $20 for the same size. As fancy as these 24" x 24" "copper" metal ceiling tiles look, they can be adhered directly to any flat drywall ceiling. These tiles are very inexpensive, mainly because they are not real copper—just plastic. So-called metal ceiling tiles are often clever reproductions made of polystyrene foam. These faux metal ceiling tiles adhere directly to the ceiling with adhesive and look amazingly like copper. Most homeowners today prefer bare metal ceiling tiles. But in days past, metal ceilings were typically painted. When the National Park Service undertook the restoration of metal ceiling tiles at Ft. Baker, in 2006, the old lead paint was removed by placing the tiles a deep freezer and then flexing them. The paint fell right off! Though considered desirable today, pressed metal ceiling panels were considered a cheap and inferior alternative to plastering.